Has your WiFi slowed to a crawl? Get back up to speed—and back to streaming videos—with this free hack! If you rely on Google to answer day-to-day questions or count on cat videos to pull you out of the post-lunch slump, slow Internet speeds can feel like the end of the world. Luckily, there’s a simple fix—and it isn’t buying up a $200 WiFi range extender. It mirrors a technique used before cable television became the norm, when people wrapped tin foil around their antennas for better reception. Here, however, a little aluminum cut from a can help your Wifi router’s signals go a long way. 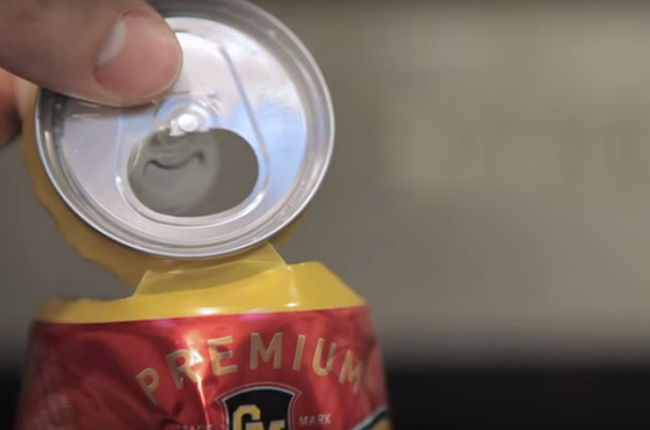 To boost your bars immediately with this trick from Hack College, start by washing out any old beer or soda can with some soapy water. Dry it thoroughly, then flip the can upside down, and cut off the bottom with your utility knife. Also make a cut along the end with the tab, but don’t lop the top off completely—leave about an inch of metal still connected in front of the drinking hole to make a flap, as shown below. The final cut will go down the can on the side opposite the metal flap. Slice the can top to bottom, and uncurl it carefully. Stretch out the aluminum on your work surface to flatten, and press down until it holds the shape. Then, when you’re ready, slip the drinking hole over your router’s antenna with the aluminum sheet up standing up tall. With your amplifier in place, sit back, relax, and enjoy the stronger connection.